This Premiere System was designed for the numerous V8 engines in the mid-size to large vehicle range. Using the double stack technology, the ES6000 combines two of our popular ES4000 cells into one sturdy unit. It's Premiere because its operating standards are set to work with commercial applications, and we include the most popular upgrades in this system kit. For this package we've paired it with a 50 amp PWM. This makes calibrating and maintaining your HHO production much easier. Simply mix a strong concentration of electrolyte and let the PWM manage the current. Set it for 15 amps and it keeps the output constant whether cold or warm. Adjust it to match the engine size exactly and enjoy the results. 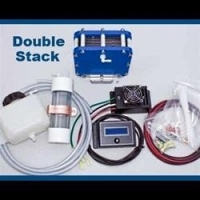 This system can also work with 24 volt electrical systems. This is a popular package for diesel engine vehicles that often do not require computer management solutions. If you need any computer enhancers, we offer the Fuel Saver Flash Chip or the EFIE Max or the Frequency MAP-MAF Enhancer for only $99 with purchase of this package. Use promo code FSE149 for your discount today. The cell overall measures 8 inches square and about 5 inches deep. The custom design allows for a balanced and predictable supply of HHO ready for your engine. Marine grade end plates are machined to commercial specifications. To keep your unit secure, we torque the stack together with 12 stainless steel bolts. The typical lifetime for this unit is over 75,000 miles and when combined with a PWM power supply, it is a tremendously reliable unit for a wide array of vehicles.